Detective Store company gives you the opportunity to cooperate and trade professional detective equipment. We offer simple rules of cooperation, high quality products, affordable prices and technical support. Wholesale costs apply to orders of minimum 3 items of one product. Our warehouse inventory enable immediate fulfillment of the order. The condition of immediate delivery (within 24 hours) is to place and confirm the order before 1:00 PM. 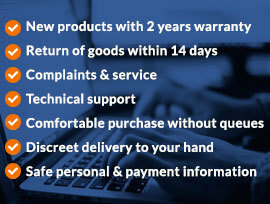 In case of prolonging the date of the delivery, the Commercial Affiliate is immediately informed about the details by phone or e-mail and has right to cancel the order without consequences. For the first three orders, the amount due is taken as a pre-payment, the following orders can be fulfilled by a bank account transfer within 7 days. To become our Commercial Affiliate, please contact our consultant. I will answer all your questions about our products and prepare individual offer for devices available on demand.